Smart technology is infiltrating many factors of our daily lives, from cameras and sensors around the house, to smart alarm clocks that can tell us how we’ve slept. Now it’s time to make our doors smarter. Electronic keypads and the like have now been out for a couple of years, but one company is looking to take door locks to the next level. 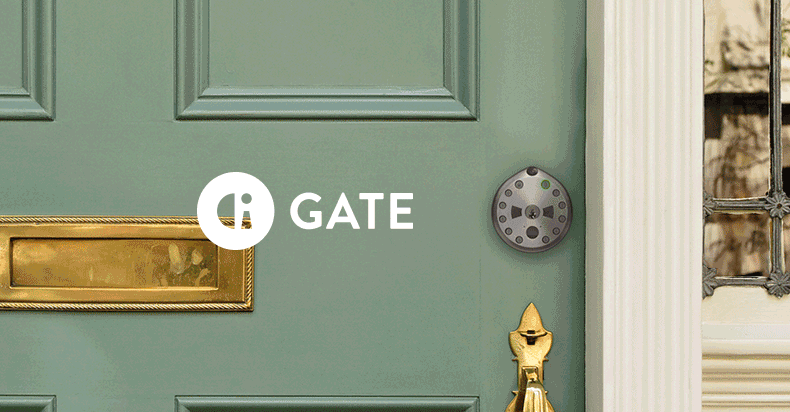 Gate, founded in 2014, is a smart locking system for your home or business that will bring functionality to your house, whether you’re home or not. The lock will enhance your deadbolt and bring with it multiple features to monitor your home and give temporary access to those you choose. There is also a key cylinder that allows for traditional entry. With Gate, you get a camera that reacts to motion outside of your door. Let’s say you’re having a lazy day and just don’t feel like getting off the couch, when someone knocks. Gate will send a notification to your phone, allowing you to check the live feed to see who’s outside. From there, you can either let events play out naturally, or you can activate the speaker through the app, giving you the ability to actually speak to the person at your door. Audio is 2-way, meaning that whoever is at the door can speak back. Maybe it’s your friend stopping by, if your laziness knows no bounds, you can then unlock the door for them from the comfort of your couch. This obviously has plenty of other uses, as well, and having your Gate smartlock connected to WiFi lets you access any of the features listed above from anywhere. Maybe the landlord is stopping by to check out something, or you’re mom wants to drop off some food, unlocking the door is possible, regardless of where you’re at when they get to your house. Another great feature of Gate is being able to program temporary access codes into the unit to allow entry into your home or business. This feature has multiple uses, but one that sticks out is for people who rent out their homes through services like AirBnB. Instead of providing a key to your guests, simply assign them a code for their visit. Once they’re gone, retract the code and access to your home is restricted again. While we don’t like to think about anything ominous happening during a visitor’s stay, by not providing them with a physical key that can be copied, you’re guaranteeing that your home is protected once they leave. Gate is currently being funded on IndieGoGo and has already doubled their goal with about a week left in the campaign. Check it out and if you’re interested you can still get in on some awesome early bird specials.